Lighting for your home and garden delivered direct to your door. 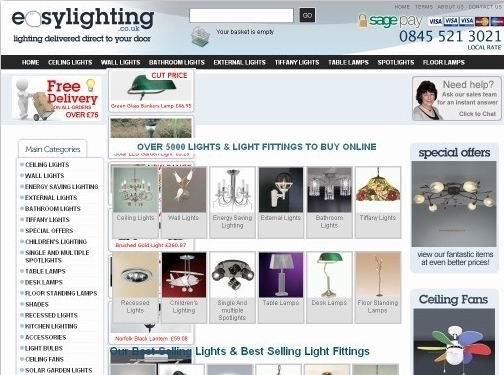 Our extensive range of ceiling lights and wall lights for every room in your house. We have decorative light fittings for your living room, bedroom, kitchen and dining room. Light your garden with lighting bollards, pedestal lights or recessed lighting for your driveway and garden. Outdoor wall lighting in traditional, contemporary and modern finishes ranging from Stainless Steel to Black. Popular lighting ranges included the wrought iron Cromwell lighting range. The Cromwell comes in an old Bronze finish and is completely hand made in England. The Windermere range of ceiling and wall lights are another traditional lighting range manufactured by Elstead lighting here in the U.K. A traditional and rustic range of lighting, made with simplicity in mind. Available in a hand finished rust patina. Our Tiffany style lights, wall lights, ceiling lights, table lamps and Tiffany floor lamps are simply beautiful. A range of fantastic colours in Tiffany wall lights, Tiffany table lamps and tiffany pendant ceiling lights. Some of our Tiffany ceiling lights are semi-flush, making them ideal for rooms with lower ceilings. Tiffany table lamps in small, medium and large sizes to suit the tables of large mansion houses as well as a small cottage. Bathroom lights in Chrome for the modern bathroom some with crystal droplets. Bathroom wall lights, bathroom ceiling lights and illuminated bathroom mirrors. For bathroom lighting for use within the bathroom zones, look for the IP44 rating.